I have my Italian roots to thank for my love of food and the kitchen.. oh and pasta. I quite literally grew up on pasta, we ate it AT LEAST once a week if not more and no one ever complained about it - why would we? Every year when we would go home to Ottawa to see my grandparents the first thing we would do when we got off the plane was sit down to eat pasta with my Nonno's home made tomato sauce, it didn't matter what time it was (1 am YUP, 3 am YUP, 9am YUP). It's a ritual and rightfully so because it's quite literally the best thing ever. I have tried to recreate his sauce a million times and it never comes out quite the same as it does when he makes it so I kind of just do my own thing now when it comes to sauce. I also healthify my version a lot because while there is a time and a place for refined carbs, my body doesn't totally love the carb coma that comes with them so I try to steer clear for the most part. In an effort to pack even more of a nutritional punch into my usual sauce I decided to try a little something different and thought I'd attempt a bolognese style sauce but without beef because I'm not about that meat life. At first I did not think this was going to work because I totally winged it but it did, oh baby did it ever. If I'm being totally honest the Italian in me is both proud and a little ashamed to be veganizing (it's a word look it up) such a classic sauce and I'm not entirely sure if I should tell my Nonno that I actually freakin' NAILED IT. It's packed with tons of secret vegetables, plant based protein and fiber! 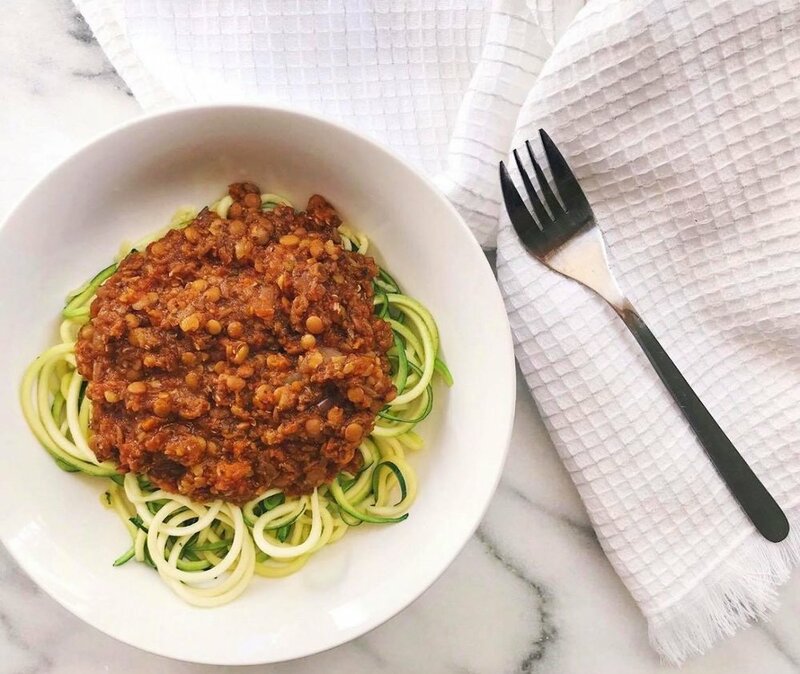 PRO TIP: Serve it over top of zoodles for a low carb option so you can load up the "meaty" sauce and it will still be light and leave you carb coma free! 1. In a medium sauce pan or pot heat the avocado oil over medium heat. 2. In a food processor pulse onion and garlic together until finely chopped, add to the pot. 3. In the same food processor (no need to wash it) add in your carrot and pulse until finely chopped, then add in mushrooms and pulse until same consistency. 4. Once the onions and garlic are translucent add in the carrots, mushrooms balsamic and spices and continue to cook on medium until fragrant - about 3-4 minutes. 5. In the same food processor add in your can of tomatoes and pulse until most of the chunks are gone, about 15 seconds. 6. Add lentils to the pot and stir until combined, then add tomatoes, cover with a lid and bring to a boil. 7. Once it is boiling reduce the heat to a simmer and cook for 30-45 minutes. 8. Transfer half of the sauce to a high power blender and pulse for 20 seconds making sure not to over blend, you want some texture still. Add the blended sauce back into the rest of the sauce and stir to combine. Serve with pasta, zoodles, spaghetti squash or whatever your heart desires!